Edible mushroom species are popular among vegetarians in European counties and are yet to have as much appreciation in the western world. Mushrooms such as porcini mushrooms, parasol mushroom, oyster mushroom and black morel show trace levels of vitamin B12 (.09 mg/100gm dried weight). 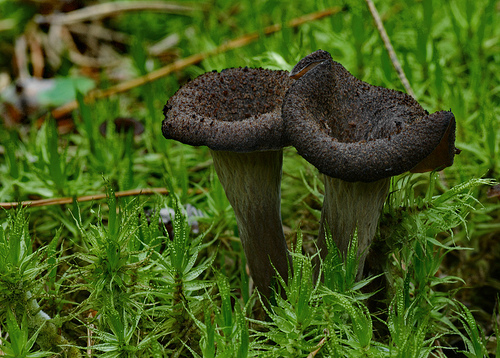 More excitingly the black trumpet and golden chanterelle contain higher levels of vitamin B12 (1.09-2.65 mg/100g dry weight). Shitake mushrooms may prove to be the most beneficial in vegetarian diets as dried shiitake mushrooms are around 5.6mg per 100 gm dried weight). This means that the daily intake of approximately 50gm of dried shiitake mushroom will meet the 2.4mg/day for the average adult. The edible algae laver is also known as nori and is most commonly seen in Sushi Trains in the wrapped around rice and tuna. Nori shows to have one of the highest bio-available sources of B12 that may hold many benefits for correcting vitamin B12 deficiencies in vegetarian diets. Dried green laver and purple laver are the most widely consumed edible algae and contain a substantial amount of Vitamin B12 (approximately 63.6 mg/100g and 32.3 mg/100g dry weight). It is important to note that the processing stages of algae such as toasting or seasoning can affect the vitamin B12 status. In one study where dried purple laver was treated by toasting until the laver colour changed from purple to green, decreased in Vitamin B12 due to the heating process. Despite this, edible purple laver in particular contains coenzyme that increase the bioactive forms of vitamin B12 in the body. Further health benefits of consuming purple laver were emphasized in a nutritional analysis of six vegan children who consumed a diet including brown rice and dried purple laver for 4-10 years which suggested that the consumption of nori may prevent vitamin B12 deficiency in vegans.